Join us for a night of fun, friends, and art at one of our Create It events. 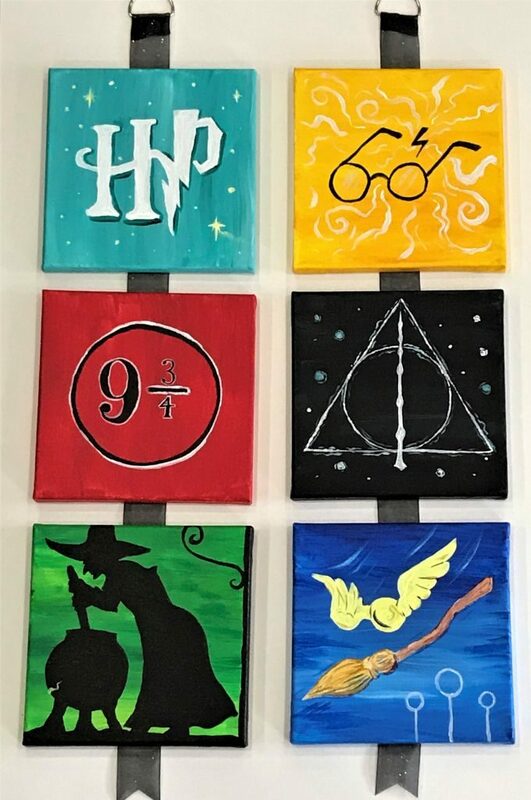 Join us as we create this unique tribute to “Harry Potter”. You will paint 3, 8″ x 8″ canvases, using stencils and your preferred color scheme. Our artist will help you step-by-step to paint your trio and a ribbon and hanger will be added when you are done. All ages welcome. The art class will start at 7pm, Gallery doors will open at 6:30pm. Bring a favorite beverage and your creative spirit… we’ll provide the rest! Fill out the form below to pay via PayPal, or reserve with a credit card by calling 615‑885‑1694. We will try our best... If reserving for more than one, please enter additional names here. Your reservation is not complete until payment has been received. Payment is non-refundable, but we will re-schedule your reservation for a future date if given 24 hours notice of cancellation.